If you have exhausted just about every troubleshooting tip you can find on the Internet for curing your iTunes problem, then you will probably have no option but to completely remove the program and then reinstall it. But, what about all the digital music in your iTunes library? This normally doesn't get removed when you uninstall iTunes, but it's still best to back it all up just in case. If you haven't got an up-to-date backup of your iTunes media library, then it's a good idea to make a copy of it on an external storage device -- such as a portable hard drive. If you are lucky enough and iTunes can still be run, then it's best to consolidate your library first before making a backup. 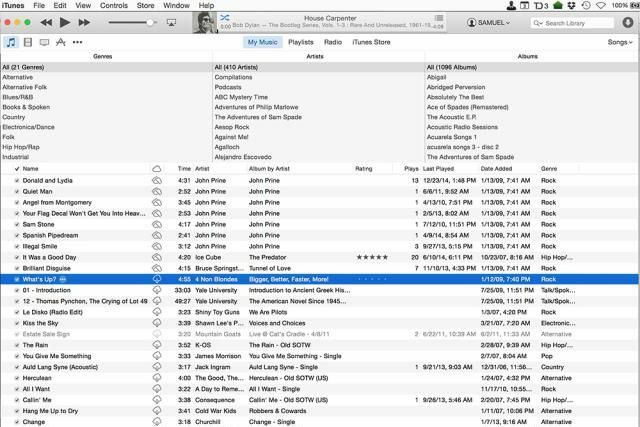 This consolidation process ensures that all the media files that make up your iTunes library are copied to the iTunes folder -- this solves the problem of having to remember where your media files are if they are spread out in different folders on your computer's hard drive. If iTunes no longer functions, then you'll probably have to miss out this consolidation process and just perform a manual backup. To see the whole process of consolidating and backing up your iTunes library, read our guide on Copying iTunes Song Files to Local Storage. Go to Programs and Features in Control Panel. If you don't know how to get to this, then click the Windows Start button and then Control Panel. Click the Programs And Features link to view the software applications installed on your machine. Look down the list of installed programs and then click on the iTunes main program. Now that you've highlighted this, click the Uninstall option -- this is located just above the name column. A message will be displayed asking if you are sure you want to remove iTunes from your computer -- click Yes to begin uninstalling. Once iTunes has been removed you'll also need to uninstall the QuickTime application. Uninstall this just like you did for the main iTunes program (steps 3 and 4). The next software component to remove is called Apple Software Update. Again, uninstall this in exactly the same way as the two previous applications. Yet another part of iTunes that you'll need to remove just in case the problem still remains is Apple Mobile Device Support. And, you guessed it -- repeat the same procedure as in the previous steps. The Bonjour service runs in the background and may be causing the fault you are experiencing with iTunes. So, remove this to be on the safe as well. Chances are you have a version of iTunes that's higher than 9. So, locate Apple Application Support and uninstall this too. You'll be glad to know this is the last one to remove. Finally, close the Programs And Features window and reboot your computer. Once Windows has restarted, install the iTunes software from scratch ensuring that you have the latest version. This can be downloaded from the iTunes website.